Working with your hands is one of the best ways to soothe anxiety and eliminate stress. 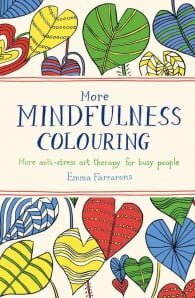 This second pocket-sized colouring book from illustrator Emma Farrarons offers a practical exercise in mindfulness that draws upon your creativity and hones your focus. Like the first book, The Mindfulness Colouring Book: Two offers delicately, hand-drawn scenes from nature and the decorative world for you to mindfully and creatively fill with colour. Take a few minutes out of your day, wherever you are, and colour your way to peace and calm. Working with your hands is one of the best ways to soothe anxiety and eliminate stress. This second pocket-sized colouring book from illustrator Emma Farrarons offers a practical exercise in mindfulness that draws upon your creativity and hones your focus. Like the first book, The Mindfulness Colouring Book: Two offers delicately, hand-drawn scenes from nature and the decorative world for you to mindfully and creatively fill with colour. Take a few minutes out of your day, wherever you are, and colour your way to peace and calm.